Knowing the approximate depth of the entrance pit raises the much more important question: How will future lunar explorers to get to the bottom of this pit? It is ironic that, after flying almost a quarter of a million miles from Earth, the task of traveling this measly additional 200 to 300 vertical feet is actually a significant and hardly trivial engineering challenge. This isn’t the movies, so flying a spacecraft down through the opening is probably not practical and is certainly too risky. Nor can the astronauts simply jump in, since even in the Moon’s weak 1/6 gravitational field the fall would probably be fatal at 200 feet. So, how will those first astronauts do it? On Earth, traveling up and down a 300 foot pit has become somewhat routine for cave explorers. You rig a sufficently long rope to a solid anchor, put on a harness, attach your rappel device to both the harness and rope, and rappel in. The rappel device, usually a rack, uses friction on the rope to control the rate of descent. To exit the pit, you attach ascenders both to the rope and to your harness. The ascenders are mechanical devices with a cam that can slide up the rope, but will lock into place when you put any weight on it. Thus you literally walk up the rope, alternating ascenders as you climb. The Moon, however, presents technical difficulties for these rope-climbing techniques. For one, the astronaut will be wearing a big spacesuit, with thick unwieldy gloves. Using both a rack and ascenders requires some delicate fingertip control. A heavily-clad astronaut might find such tasks difficult. For another, how will the astronaut put on his harness? Then there is the question of the lower lunar gravity: Will it require a redesign of the rack and ascenders to make them work properly? For example, in climbing it helps to have some weight pulling down on the rope so that the ascenders will slide up easily, then lock instantly when you stand on them. The Moon’s low gravity might make it more difficult for an Earth-designed ascender to slide up the rope. Similarly, the low gravity might make it difficult for the rappel rack to provide the proper amount of friction during descent. I am not an engineer, so I am very curious to hear what other vertical experts (cavers, rock-climbers, etc) as well as the engineers out there think of this, and if they have any suggestions of their own. The key is to keep the solution as simple as possible, and as small as possible so as to not add any unnecessary weight. Bob, Please note the device Don offered is also the rappel device that requires no power for rappel. Only one is required. Very simple! I doubt that any type of rope would be used beyond possible initial exploration. If there really will be a manned base in such a lava tube they would install some type of lift, possibly a simple platform that moves up and down on a rigid pole. Even for initial exploration ropes seem unlikely. How would they deal with getting over the edge? Some type of jet pack or personal rocket would be more reasonable. That was my first thought as well, that a powered device of some sort would be needed. Of course you’d want at least 3, with two people, if you didn’t have sufficient backups you’d be hosed if anything broke down. I’m sure for the same reasons of mobility at the very least there would be some analogue to the original moon buggy. Anchoring to this with some sort of roller or cantilever at the rim would provide both a convenient anchor and a last resort method of raising the astronauts should a problem arise by slowly driving the buggy away from the rim or winching them up. Or perhaps the buggy itself could be powered so as to be able to fly it into the pit. That might be able to provide more protection than dropping someone in with a jetpack arrangement. Smack a rock too hard, tear a suit, and you’re done for. Or even perhaps a small lander inside the pit that could carry or shoot a line up to the rim to make a tyrolean of sorts to avoid negotiating the sides and any loose material. That would probably be the cleanest and safest way to do it. That’s the other thing, if they do get down there, it’s not unthinkable that it would not have the nice soft covering of dust that the lunar surace does. It could be quite rough (looks like it from the image above) and as difficult to negotiate as a terrestrial cave, and we all know how hard that is on gear. I wouldn’t want to do very much at all without a much more durable space suit design than what is currently in use. Greater mobility would also be a key to actually being able to do anything once you were there. Assuming the astronaut weighs 120kg and has to descend 60m, the total potential energy change is 120*60*10/6 = 12kJ. This is not very much energy. A 1,2 volt 2Ah rechargeable battery contains 1,2*3600*2 Joules which is about 8kJ. A motor of 10W power would deliver 12kJ in 20 minutes and I don’t think that would be too long. So I think going up and down using electrical power (recharged by solar power) is reasonable. Power requirements could be made even smaller if the system used a counterbalance. My preferred option would be to install a highline right across the crater, belayed back from the lip and with some kind of tripod to hold it it up above the ground. An astronaut can then be pulled across the highline into the middle of the shaft and then lowered down. That way they keep well away from sharp sides. If the motor system failed, another astronaut could simply pull a colleague up. 1/6 of 120kg is only 20kg, so with a simple hand crank on the motor to provide mechanical advantage this wouldn’t be difficult. A second winch could be mounted at the astronaut’s end, so that if the system became jammed the astronaut could simply wind themself up. A hand winch would be easy to use. As a long time caver that learned to do all descending and ascending of rope under my own power, I never questioned that mindset of that’s the way it had to be for many years. When I first crossed into the rescue realm, and more specifically into the firefighter rope rescue realm, I saw that their standard practice was to have the rescuer clipped into the end of the rope and other team members controlled the raise and lower. My initial reaction was why would anyone want to do that? But it makes a lot of sense in some circumstances. This seems like an ideal situation for that. One factor that quickly adds to considerations for hauling back up is edge friction. Height advantage at the edge can help with this such as a tripod or a boom on the lunar rover. Depending on the lip of the drop, a simple edge roller can sometimes make a huge difference. So another astronaut would still have to work with a rope or cable but not necessarily require the dexterity of a rack or climbing system. A large figure 8 would be much easier and plenty sufficient for a lower. And a simple pre-rigged haul system with a rope grab fashioned in a way that could be used to grasp a rope with thick gloved hands would work. Or a device such as SkyHook’s rope winch could do both with a single device. It also allows easy change from lower to haul and would not require any electrical power. But, will we have to climb at all? Surely, there’s some kind of formation (a partially collapsed opening?) that circumvents the need for climbing in and out. More extensive mapping is definitely called for. I’m envisioning small, mass-produced landers put down around and inside these openings. Steve asked if there is a way to get into a lavatube cave that is *not* a pit/skylight entrance. Here on Earth the answer is yes there are. These are horizontal entrances into the lavatube from the ends of the open collapse trench/sinuous rille, if the tube is connected to one. The LROC Team noted they would be looking at oblique angle shots to try to discover such entrances at known sinuos rille endpoints. As to getting into and out of a cave through a skylight, however, no one has remembered what precedes human exploration. That is,…robots. At the NSS-in-Second Life island run by Oregon L5 Society, we are looking at the robots, because they can be smaller, cheaper, and leave behind them a means for the humans to get down into the cave safely, before a human landing takes place *if* the robot reports indicate that is a good idea. First, you want to know if there actually exists a void of significance down there out of view. A Ground-Penetrating Radar (GPR) can do that. 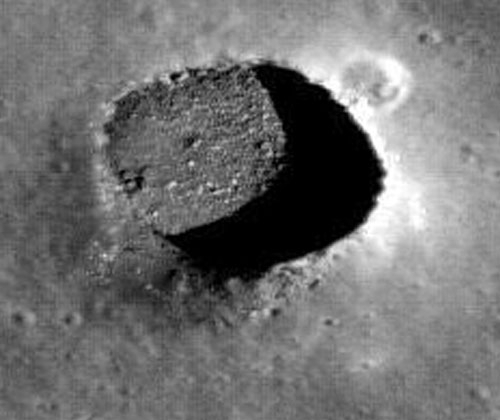 If we are lucky we may get exploration-oriented investment in an imaging orbiting GPR, and find most lavatubes on the Moon within about 2 kilometers of the surface, besides getting scads of data about other subsurface lunar structures that good science can be done from. If that is not funded, then we would have to use a site-specific GPR that would roll around on a cart taking data to be processed into images on Earth that would give us an idea of the tube’s dimensions, if it exists beyond the skylight. Second, you want to know what the inside looks like on the inside. Pictures and even Thematic-mapper sensing can be taken from the floor, but that is problematical. Enter most lavatubes on Earth, and you will find “breakdown” littering the floor. That’s the rock that fell from the roof within about 2 weeks of the tube’s emplacement, as the ceiling cooled, and cracked. Often, secondary flows of lava have “rafted” these large boulders into piles. It seems in Earth lavatubes that breakdown boulders scale in size with the cave. Since lunar lavatubes are hundreds of meters across, compared to Earth lavatubes that max out at about 25-30m, we should expect breakdown boulders to the same larger scale. That means very possibly your robot would face piles of rafted boulders on the floor as big as a house, and, like breakdown here, some of those will be “tippy”. Trust me, that is *not* fun! So, we are looking at one or more landed flying imagers that would use LIDAR to avoid the walls, ceiling, and floor, to fly down the center of the cave, sending back to its lander pictures and other data by a fiber optic cable trailing behind. It is supported and propelled by rockets. This is a short fast probe that will have a definitely limited range, on the order of a kilometer or 2, most likely. If you are looking for water ice, there are also propellant issues to be traded off against size that may limit range. Just before its tanks run dry, the flyer rises to the ceiling, and uses a sub-system to stick itself to the ceiling, which is less problematical than a rough floor landing. The pictures are studied for determining if the cave is worth the next robot mission. That small robot would crawl off its lander and rappel down to the level of the ceiling, extend its 6 legs, and use gecko-tech footpads to walk along the ceiling taking pictures and close look data as it goes, especially of water ice deposits, if any. It leaves behind it in both the rappel and the ceiling crawl a path of pads stuck to the highly silicious basalt by adhesives similar to what is used in the electronics industry to glue silicon dioxide to other things in vacuum. It should be able to do this at least as far as the flyer has already mapped the cave. It leaves a light cable strung through large eyes on the pads, both going out and returning to the skylight. Its data is now evaluated as to whether or not a human crewed flight should be invested in. The humans land beside the 2 robot landers, and now use the prepared light cable to pull a heavier cable through the eyes. They safely descend on this cable, and begin installing an inflatable habitat, hung from many of the ceiling pads, to live in while they explore the tube’s full extent. If possible, they use the cable to transport more flyers along the ceiling, and send them further down the cave, before deciding if the tube is worth further investment after thorough exploration. This is safer for the human explorers, and safer for the checkbooks of the almost certainly private group funding them, with cutouts at each step. Sorry this went so long.